Senator praises Dr. Ford, questions Judge Kavanaugh during hearing. WASHINGTON — Following a day of emotional testimony by Supreme Court nominee Judge Brett Kavanaugh and Dr. Christine Blasey Ford, who has accused him of sexual assault when they were both in high school, the Senate Judiciary Committee on Friday voted along party lines to send the nomination to the full Senate. According to CNN, at the request of committee member Sen. Jeff Flake (R-Ariz.), Senate will not vote until the FBI has conducted a one-week investigation into the allegations by Ford and two other women. During questioning of Ford and Kavanaugh on Thursday, Democrats on the committee had called for an FBI probe, which Republicans denounced as a delaying tactic. Hirono: We all know that the prosecutor [Rachel Mitchell, who questioned Ford on behalf of the Republican committee members], even though this clearly is not a criminal proceeding, is asking Dr. Ford all kinds of questions about what happened before and after, but basically not during the attack. The prosecutor should know that sexual assault survivors often do not remember peripheral information such as what happened before or after the traumatic event, and yet, she will persist in asking these questions, all to undermine the memory and basically, the credibility of Dr. Ford. But we all know Dr. Ford’s memory of the assault is very clear. Dr. Ford, the Republican’s prosecutor has asked you all kinds of questions about who you called and when, asking details that would be asked in a cross-examination of a witness in a criminal trial. But this is not a criminal proceeding. This is a confirmation proceeding. I think I know what she’s trying to get at, so I’ll just ask you very plainly, Dr. Ford, is there a political motivation for your coming forward with your account of the assault by Brett Kavanaugh? Ford: No, and I’d like to reiterate that again, I was trying to get the information to you while there was still a list of … what looked like equally qualified candidates. Hirono: Dr. Ford, I’d like to join my colleagues who have thanked you for coming forward today. And I and we all admire you for what you’re doing, and I understand why you have come forward. You wanted us and the American people to know what you knew about the character, the character of a man we are considering for a lifetime appointment to the Supreme Court. I want to take a moment, also, to note the significant personal sacrifices you’ve made to come forward to share your traumatic experience with us and the American people. You’ve had to move. You’ve had death threats, all manner of — of basically re-victimization experiences have come your ways. But by coming forward, you have inserted the question of character into this nomination, and hopefully, back into American life, and rightly so. We should be made to face the question of who it is we are putting in positions of power and decision-making in this country. We should look the question square in the face: does character matter? Do our values, our real values about what is right and what is wrong, and about whether we treat our fellow human beings with dignity and respect, do they matter anymore? I believe they do, and I believe the reaction we have seen to … your courage all over this country shows us that we’re not alone, you’re not alone; that women and men all across America are disgusted and sick and tired of the way basic human decency has been driven from our public life. Once again, Dr. Ford, thank you very much. This is a moment for our country. Mahalo. Following a break, and with Ford no longer in the room, Hirono questioned Kavanaugh. Hirono: Judge Kavanaugh, my colleagues on the other side are accusing the Democrats of some sort of political conspiracy, but that’s because they want to distract us from what happened here this morning. And what happened here this morning was that we heard from Dr. Christine Ford, who spoke to us, with quiet, raw, emotional power, about what happened to her. She said she was 100 percent certain that it was you who attacked her. And she explained how she came forward, how she struggled with her decision, how she wanted the president to know so that he could make a better choice. So when you and my colleagues on the other side accuse us of ambushing you with false charges, I think we all have to remember Dr. Ford’s testimony and her courage. Let me go back to something you just said in your opening. You said you thought, at your first hearing, the Democrats were an embarrassment. We asked you a lot of questions in those days, and which of our questions do you think were an embarrassment? I asked you about dissents you had written as a judge, an amicus brief you wrote as a lawyer and your knowledge of sexual harassment and abuse by your close friend and mentor, Alex Kozinski, all valid questions … because this is a job interview for one of the most important positions of trust in this country. And earlier, you agreed that this process of advice and consent is really a job interview, certainly not a criminal trial. There’s certainly no entitlement for you to be confirmed to the Supreme Court. Our credibility, character and candor of a nominee, things for us consider in your job interview? Kavanaugh: I think my whole life is subject to consideration. Hirono: Is that a yes? Credibility, character and candor … are those specific traits that would be of interest to us, as we consider putting you, for life, on the highest court in the country? Credibility, character and candor … Is temperament also an important trait for us to consider? Kavanaugh: For 12 years, everyone who has appeared before me on the D.C. Circuit has praised my judicial temperament. That’s why I have the unanimous, well-qualified rating from the American Bar Association and all of the people who have appeared before you. Hirono: So the answer is yes. I am running out of time … so let me get to something else. In your Fox News interview, you said that you, quote, “always treated women with dignity and respect,” end quote, and that in high school you never, quote, “drank so much that you couldn’t remember what happened the night before.” Would you say the same thing about your college life? Hirono: So I’d like to read your statements from people who knew you in college … James Roche said, your roommate, “Although Brett was normally reserved, he was a notably heavy drinker, even by the standards of the time. And he became aggressive and belligerent when he was drunk.” So is your former college roommate lying? Kavanaugh: I would refer you to what I said in the sealed or redacted portion about his relationship with the other two roommates, and I’m going to leave it at that … Senator, you were asking about college. I got into Yale Law School. That’s the number one law school in the country. I had no connections there. I got there by busting my tail in college. Kavanaugh: I’m sorry. It’s ranked number one, that doesn’t mean it’s number one. [laughter]And you know, in college – two things. A, I studied. I was in cross-campus library every night. And B, I played basketball for the junior varsity. I tried out for the varsity. The first day I arrived on campus, we had captain’s workouts. I played basketball every day, all throughout – and then as soon as the season was over, in late February, captain’s workouts started again. I was obsessed with being the best basketball player. Hirono: So you were not a “sloppy drunk,” and so, your roommate was lying. Kavanaugh: I will refer you, again, to the redacted portion. I’ll say, look at my academic record, and I don’t usually to talk about myself this way, but … I worked very hard in college, in my studies, and I also played basketball, I did sports and I also did socialize. 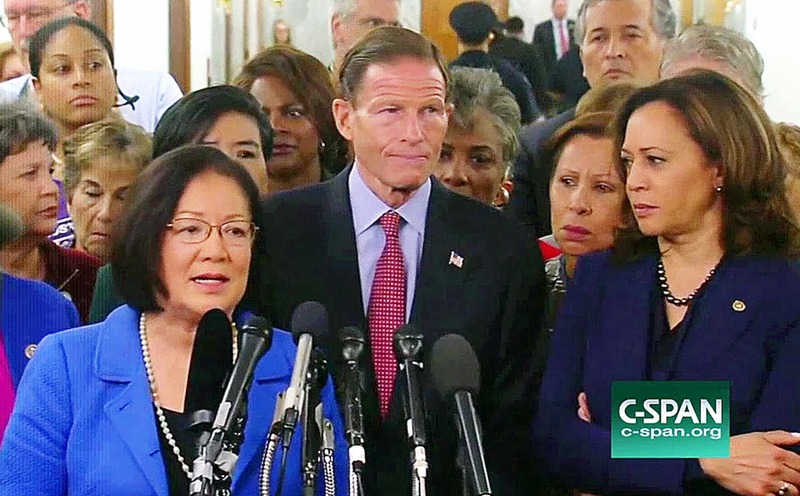 Hirono: I know that the chairman is going to stop me, but … I’d like to enter into the record four letters – one is dated Sept. 18, 2018, to you, from all of the Democrats on this committee. Another is a letter, dated Sept. 18, to Christopher Wray, the director of the FBI, and Don McGahn, council to the president, signed by all the Democrats on this committee. A Sept. 21 letter signed by [Senate Minority Leader] Chuck Schumer and [ranking Democrat on the Judiciary Committee]Dianne Feinstein to the president, and a Sept. 26 letter signed by all the Democrats on this committee, all requesting an FBI investigation because you did say all we have to do is ask. And the implication being that if we ask, an investigation will happen and it certainly has not happened. Thank you, Mr. Chairman.